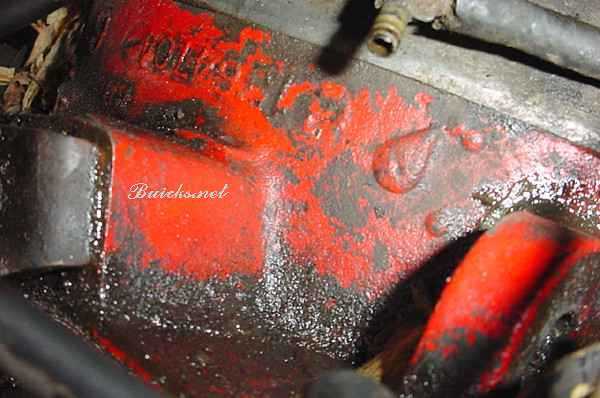 The Buick red nailhead engine appeared in 1965. 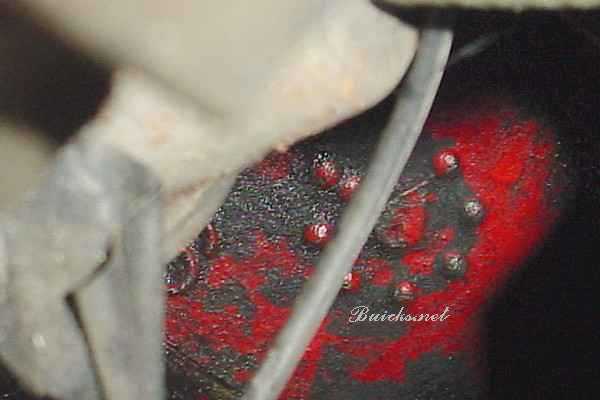 Generally, if you are looking at a 1965 or 1966 red nailhead, you are looking at a 425. The exception is in the skylark. The 401 in the skylark was also red! 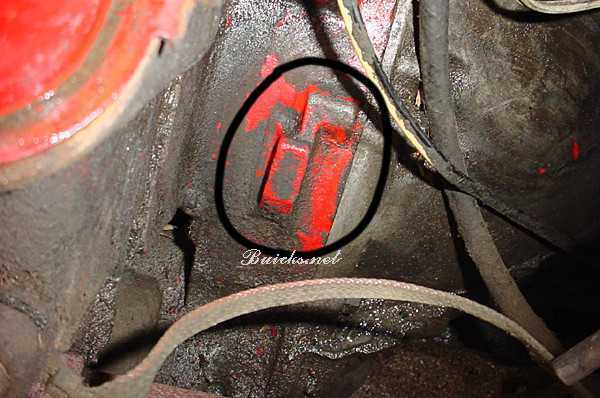 1966-1970 Riviera Owners Association Technical Advisor"
Sometimes, the codes have been found to be missing or incorrect. Sometimes the casting number can be either a 401 or a 425. How can you tell which it is! Well, finally some answers on this topic instead of more questions... We had 2 owners of '66s that had MT code engines... an incongruity that needed explaining. Were these mismarked 425s, or 401s that shouldn't be in the car? The engine stamping/markings were almost certainly factory correct in appearance. I bundled up all the information accumulated on this topic and mailed it off to Denny Manner, the absolute expert on all things related to Buick engine manufacturing. His reply follows (what's in quotes is his direct words, the rest is my understanding/ communication of it). PLEASE NOTE:I have seen this nub on a 401! I have also been made aware of others who have seen this nub on a 401. This makes sense to me now. I can easily imagine a boring machine that has a feeler on it to check for the casting bump... and then the machine using that to determine what the bore size is. Pretty slick. Therefore, one must conclude that if the block went down this normal machining production line, it would've automatically been bored for 425. Denny further states that his 1966 has a block casting number of 1364704. He said it's possible that there could've been other casting numbers in previous years. He reminds us that 'the service/parts books do not list the casting number... it would list a machined block ready for assembly or service repair that a dealer could order'. Denny further states '401 and 425 castings were different- the cylinder wall castings were in different locations adjusted for the bore size'. Now as to the other markings on the block. There are what look like clock hands pointing to raised bumps on the block and other assorted numbers. Denny says that these are only foundry codes (as we suspected). They are used to identify the mold numbers (I'm guessing that to be the number off to the side of the casting number) and the other identifies the date and shift the casting was made (no doubt for quality control purposes). So, in summary, we now are certain that the two engines with MT engine code stampings are both 425 blocks. The casting numbers AND the locator rectangle both confirm that. And, we now know the locator was used by a boring machine to correctly bore the right size holes for 425 displacement. So, unless the block bypassed this process line automation for some weird reason, it would've received the bore of a 425 automatically. It's possible to physically check the displacement as a final check, but it's pretty clear the factory was intending to put a 425 cu. in. engine in the engine bay. I'm therefore led to believe that whoever was stamping those engine blocks screwed up... creating this mystery for us 38 years later. 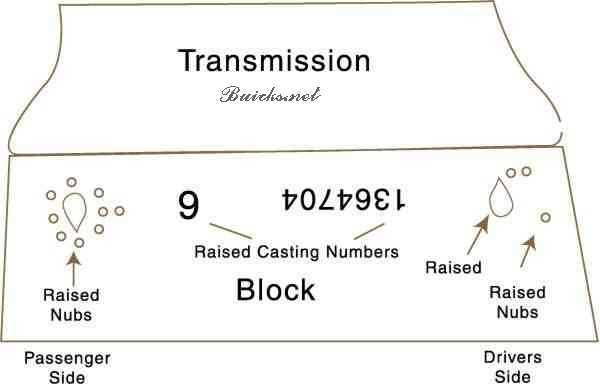 I must add to this article that I have seen a 401 with the described casting block!